China based online E-commerce store, Everbuying.net is conducting 2015 Elephone Wednesday Flash Sale from October 9 to November 25. This sale happens every Wednesday at Everbuying.net for one hour starting at 13:00 GMT. In this flash sale you can purchase High-end and low-end smartphones saving almost about $50 on your purchase. So stay tuned every Wednesday till November 25 and grab your Elephone device at affordable price. This sale includes Elephone Smartphones like Elephone M2, Elephone M1, Elephone Q and Elephone Trunk. The good part is that it includes free world-wide shipping and the device is unlocked for world-wide use. Now let’s have a look at each of these deivces one by one. Elephone M2 is the high-end Android 5.1 Lollipop Smartphone and the actual price of the device is $199.99 while in this flash sale you can grab it for $149.99. The device features a 5.5 Inch FHD 5-point touch capacitive display and is powered by a 1.3 GHz 64-bit Octa-Core MTK6753 processor combined with Mali-T720 GPU, 3GB RAM and 32GB internal storage which is expandable up to 128 GB via microSD card. Elephone M2 sports a 13.0 MP primary rear camera with Touch to focus, Auto Focus, Flashlight, Video Recording etc. and it also comes with a 5.0 MP front facing camera. The entire unit is backed by a 2600mAh Lithium polymer battery. Check out more about Elephone M2 here. Elephone M1 is another high-end Android Lollipop smartphone featuring 5.5 Inch HD display with 5-point touch. It is powered by a 1.3 GHz 64-bit Quad-Core MTK6735 processor with Mali-T720 GPU, 2GB RAM and 16GB internal storage. Elephone M1 sports a 13.0 MP primary camera with touch focus, auto focus, flash light, video recording etc. and a 2.0 MP front facing camera for selfies. 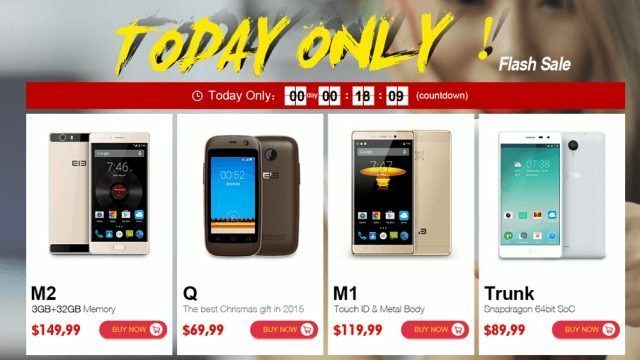 The actual price of the device is 159.99 but in this 2015 Elephone Wednesday Flash Sale you can grab the device for $119.99. Check out more about Elephone M1 here. Elephone Q is the budget smartphone running on Android 4.4 KitKat and featuring a 2.45 Inch capacitive display with 240 x 432 resolution. The packs a 1.2 GHz Dual-Core MTK6572 Processor combined with Mali-400 MP GPU, 512 MB RAM and 4GB internal storage. Elephone Q sports a 2.0 MP primary camera along with 0.3 MP front facing camera. Elephone Q can be a best Christmas gift for your kids. The actual price of Elephone Q is $99.99 but you can grab the device for $69.99 in this flash sale. Check out more about Elephone Q here. Elephone Trunk is the fourth device which is going to be on this flash sale and it is a mid-range smartphone running on Android 5.1 Lollipop and featuring 5.0 inch HD IPS+OGS display with beautiful display. The device packs a 1.2 GHz Snapdragon 410 processor coupled with Adreno 306 GPU, 2GB RAM and 16GB internal storage. Elephone Trunk comes with a 13.0 MP primary rear camera with video recording, Flash light etc. and it also has a 2.0 MP front facing camera for video chatting. The actual price of Elephone Trunk $119.99 and in this flash sale the device will be available for $89.99. Check out more about Elephone Trunk here. We recommend you bookmark this page and checkout every Wednesday to grab your Elephone smartphone at discounted price. 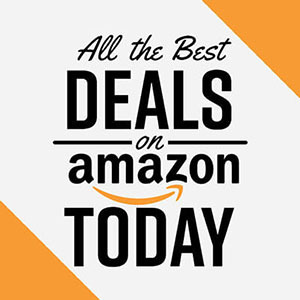 If you think we helped you in saving some bucks on your purchase then consider sharing this page with your friends and help them in saving their hard earned money.